This page might be saving cookies on your computer and/or collecting other data, I don't know and don't make any use of it. If you do not agree, please leave! 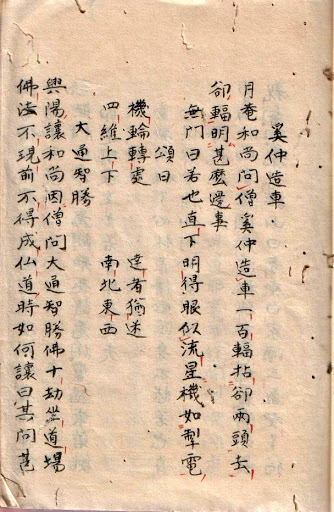 To experience how quick one can get lost in translation, let’s for example have a look at a piece from the Mumonkan (無門關), a collection of Zen dialogues compiled in the 13th century by Mumon Ekai (無門慧開). Case 8 tells us about a wagon fabricated by Keichu (the legendary Chinese craftsman) which is counting 100 spokes (dividing up into 50 spokes per wheel for the at his time common two-wheel model). 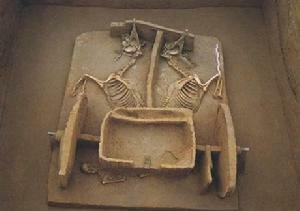 Keichu’s wagon excavated, can you see any spokes? Doesn’t this sound like a ridiculous number of spokes? Considering the Buddhist wheel (法輪) has just eight spokes, and the famous wheel mentioned in the Tao Te Ching (道德經) is satisfied with 30 spokes, yet making a point on not the spokes but the empty hub make the wheel functioning. For sure, this masterpiece of a wheel with 50 spokes, which (according to Mumon) when rotating even makes a master feel dizzy (機輪轉處/達者猶迷), it has far too many spokes! You probably now can easily guess what this cleverly fabricated but unnecessary and potentially confusing bunch of spokes stands for, what you should best do with it and what you get after mission completed … we shall leave this little exercise to the reader. To get back to our topic, how is the ancient Chinese text (which in the original reads 奚仲造車一百輻) often translated? “Keichu made one hundred carts“. Well, he didn’t … and lost you get with all the speculations built on such mistranslation. Scholarly Appendix: I assume this common misunderstanding is caused by mistakenly reading 輻 as an ancient classifier for counting carts, which is instead written (quite similar) as 輛. I was at first thrown off the scent by Chinese versions of the text which employed both characters in a bit random fashion, supporting the “one hundred carts” reading, yet I could not find any hint that the character 輻 has ever been used as a classifier for counting equivalent to 輛. Could it be an erroneous reading from the ancient hand-written original? Until recently a 15th century Japanese woodblock print was considered the eldest version available, almost all English translations are based on it. After some research I found that around 2006 a much elder handwritten version was discovered, dating back to the 13th century. Alas, the Taipei based museum which once displayed a facsimile on-line ceased to exist, and it took me some precious time to find a copy in the depths of the world wide web. It very clearly reads 造車一百輻, no doubt is possible. So far, I guess we have good reason to believe Mumon talked of a wagon with hundred spokes, and not one hundred wagon. I’d be most happy to hear comments by scholars of Classical Chinese on this very crucial point! Thank you for reading! If you liked it, why not share it with your friends? Registration for this seminar is open! Registration is via the website of Benediktushof. Main teaching language is German (English, French or Japanese support upon request).